In 1982, Richard Ashton wrote an produced a 19 minute video tour of Channel Seven, which is presented by Peter Dean. Peter Dean takes us through a tour of TVW Channel 7 in Perth, Western Australia, when it was still an autonomous station and not locked into a particular network. It shows an era when programs were still being freighted in by air daily, with courier Fred Hanzel shuttling containers of film and videotape back and forth between the airport and the studios. The film department’s Herbert French was looking after the TVW end of handling and despatch with Bill Beaton the Film Vault Supervisor. Others in the film section at that time were Isabel Bruce and Gerda Rohr, though Fred Hanzel’s wife Nell often relieved. 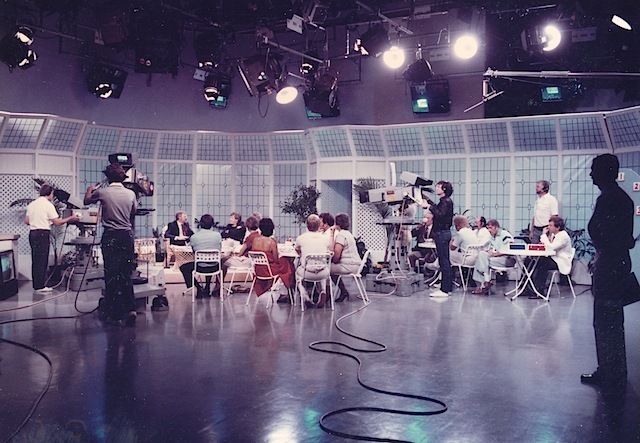 We see activity in TVW’s Studio One with production of the ‘Late Late Breakfast Show’ which was presented by Ted Bull. In the control room we see Bill Snadden looking after the lighting, technical director Tom Creamer, program director Phil Booth and Steve Holden in audio, then in the Newsroom there’s the news editor Stuart Joynt and newsreader Peter Waltham. Other staff credited include cameras: Alan Hurley, Lance Bennett, Don Linsay, Tib Lanyi, Ian Markley, Shane Street, Brent Sumner and Marshall Taylor. Audio: Tim Thunder, Phil You’d and Peter Clifford. Videotapes: Norm Bruce. GMX Editor: Glenn Robinson. Technical Directors: Mark Gaynor and Paul Weston. Floor Managers: John Easton and John Peters. Lighting: Brian Grosse, Tim Laffey and Peter Loney. Transmitter: Kevin Reeves. Program Control: Les Johnson. Operations: Sherryl Gardiner and Tracey Ingram. Technical Staff: Kevin Baker, Geoff Finlay, Steve Quartly and Steve Ramsay. Engineering Separtment: Ross Argyle, Steve Binks, Chris Cant, Geoff McCann and Con Michael. Outside Broadcast: Peter Dales, Chris Ford, John Maker and Jim Tinker. News: Bob Goodall, Norm O’Loughlin and John Rudd. 1982 Telethon with Sammy Davis Jnr. It was a time when Robert Holmes à Court controlled the station, and soon afterin 1983, John Reynolds was Group General Manager for TVW (1983-1985), Bob Hawke became Australia’s Prime Minister and former TVW journalist Brian Burke became the Western Australian Premier, Alan Bond’s successful America’s Cup bid with Australia II ended the longest sporting winning streak in history of 132 years, Bond Corporation bought STW Channel 9, Telethon featured Sammy Davis Jnr., Jackie Trent and Tony Hatch, the ‘Late Late Breakfast Show’ was presented by Ted Bull, the National Rowing Championships were held in the Canning River, and sadly, Victoria suffered devastation as a result of Ash Wednesday. Peter Waltham had then made the move to STW Channel 9. 1980 TVW7 turns 21. The young photographers award is introduced. John Lennon shot dead. It was the year of the Moscow Olympics boycott as the Seven network broadcast the games live via satellite. TVW presented the World Professional Ballroom Dancing Championships. Seven also premiered the long running shows Wheel Of Fortune, A Country Practice and Sons and Daughters in 1981/82. 1981 Sir James Cruthers retires as Chairman of TVW Channel Seven and is replaced by Robert Holmes a’ Court. The wedding of Prince Charles and Lady Diana Spencer is televised on ABC and every commercial television station in Australia. President Reagan was shot, but not seriously. A dingo takes Lindy Chamberlain’s baby. The first space shuttle is launched. 96fm Stereo becomes Perth’s first commercials FM radio station. 1982 Seven began experimenting with stereo sound during 1982. The Falklands were invaded. Princess of Wales gave birth to Prince William. Jon Sanders returned home after sailing twice around the world. Seven organises The Celebrity Challenge in support of the International Year of the Disabled. 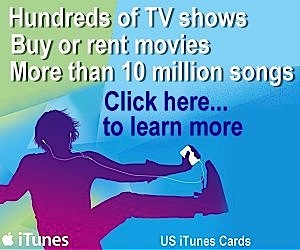 Wheel of Fortune begins along with The New Price Is Right. The beginning of A Country Practice. Sammy Davis Jnr. visits Telethon. Robert Holmes à Court’s acquired Lord Lew Grade’s Associated Communications Corporation, a major British entertainment group (1966–1982), which included the Stoll Moss group of thirteen theatres in London’s West End and ATV Music Publishing, which acquired the rights to the Lennon/McCartney song catalogue, Northern Songs, in 1968. The catalogue featured nearly every song written by John Lennon and Paul McCartney until The Beatles’ split in 1970. 1983 Australia wins the America’s Cup ending the longest sporting winning streak in history of 132 years. Bob Hawke becomes Australia’s Prime Minister. Brian Burke becomes the Western Australian Premier. 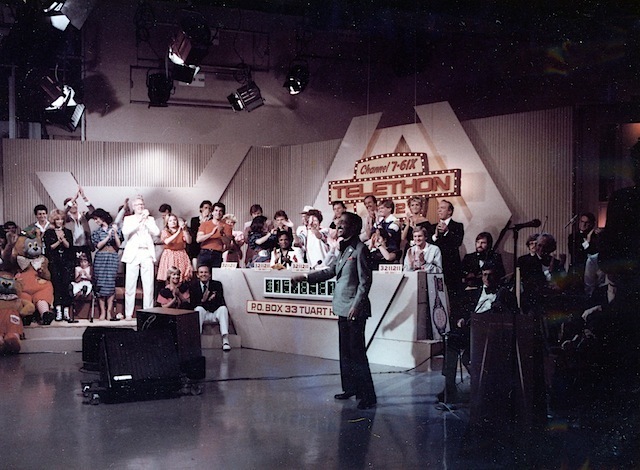 Jackie Trent and Tony Hatch visit Telethon. Victoria suffered devastation as a result of Ash Wednesday. 1984 Iran and Iraq went to war. Indira Ghandi was assassinated. Channel Seven covers the Winter Olympics from Sarajevo in Yugoslavia. State Affair began. Gene Pitney and Cliff Richard visit Telethon. 1985 Jeff Newman hosts Miss West Coast. Susannah Carr joins the Channel Seven news team. Bob Geldof launches Live Aid, the world’s first international TV satellite appeal. Robert Holmes à Court placed ATV Music Publishing (which acquired the rights to the Lennon/McCartney song catalogue, Northern Songs) on the market with singer Michael Jackson winning the bid for a reported $47.5 million. Holmes a Court added a Telethon appearance to the deal, bringing the biggest star in the world to the 1985 Channel 7 Telethon. Though Michael Jackson made an appearance, he not perform due to contractual reasons. 1986 The AUSSAT satellites are launched. Good Morning Perth starts. Prince Andrew and Sarah Ferguson marry. Halley’s Comet returns after 76 years. OTC opens satellite and cable facilities in Perth. The Pope visits Australia. Petula Clarke and Dame Edna visit Telethon. First regular Stereocast with 96fm called FMTV. 1987 America regains the Americas Cup when Dennis Conner wins it back for the San Diego Yacht Club. The Eagles join the VFL. Pat Cash wins Wimbleton. Stevie Wonder visits Telethon. 1988 Seven’s new evening soap Home And Away launches. Christopher Skase and Qintex expanded the Seven network by buying TVW-7 Perth for $130m in 1988, relaunched the station with a new logo in 1989 and Direct Satellite broadcasting becomes the norm. Whitney Houston visits Telethon. 1989 by the end of 1989 Qintex had gone into receivership. Seven launches the Love You Perth promotion. 1980 – The TVW7 net operating profit for the year increased 8.1% to $4,600,000 and a dividend of 30%. 1981 – Sir James Cruthers retires as Chairman of TVW Channel Seven and is replaced by Robert Holmes à Court. 1981 – Miss West Coast hosted by Lionel Yorke. 1982 – The Seven News team won the national Thorn and Penguin awards for the best news coverage of the bulk-ore carrier Co-op Marine, which ran aground off the coast at Port Hedland, W.A. 1982 – The average overall ratings achieved by TVW-7 were 44% of Perth’s viewers compared with 42.4% for STW-9. 1982 – TVW-7 News-reader Peter Waltham is lured ‘down-the-hill’ to STW-9. 1983 – Bond Corporation buys control of STW-9. 1983 – Alan Bond’s successful America’s Cup bid with Australia II. 1986 – ‘Good Morning Perth’ starts when ‘Perth Today’ becomes ‘Good Morning Perth’ and Seven join STW-9 in transmitting their News at 6 p.m. Monday to Friday. Seven now has twelve of the Top Twenty to STW-9’s eight. 1986 – The Hawke Labor Government changed regulations in November 1986 removing obstacles to centralisation and resultant program networking. 1987 – America regains the Americas Cup at Fremantle, WA. 1987 – The West Australian sold to Robert Holmes à Court’s Bell Group which necessitated the divesting of TVW-7 (Perth) and SAS (Adelaide) to the Christopher Skase Quintex Group in 1988. 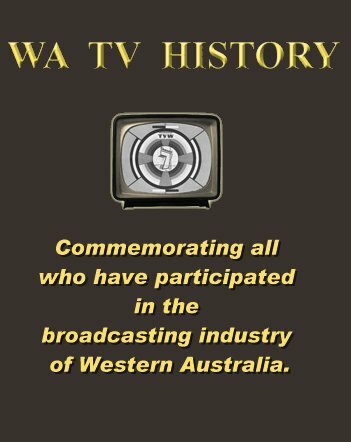 1988 – Greg Byrne Managing Director of TVW (1988-1992) taking over from Kevin Campbell who moved to the Seven Network in the East – TVW had a staff of 250 people. 1988 – Alan Bond, through Bond Corporation, gains control of Bell Group and hence the West Australian. 1988 – NEW Channel 10 opens on Friday May 20th, 1988. Many technological improvements also took place in the 1980’s. 1981 NASA launches the first Space Shuttle. 1981 Adam Osborne developed the first “portable” computer. Using C/PM, as an operating system. 1981 The Pacman and Donkey Kong video games become huge hits. 1981 Xerox develops the first Graphical user interface known as 8010 Star, but never releases it to the public. It is the first computer to use windows, icons, menus, and pointing. 1981 PC-DOS, MS-DOS and the first IBM-PC invented. 1982 The United States Federal Communications Commission (FCC) approves cell phone production in the US. 1983 The Apple Lisa created after being inspired by the Xerox developed Graphical user interface. 1983 Computers are using the TCP/IP language to communicate within the Internet network. 1984 Commodore introduces the Commodore 64, which sold more than 22 million units and is recognised by the 2006 Guinness Book of World Records as the greatest selling single computer model of all time. 1984 Domain Naming System (DNS) is born giving English type names to Internet sites rather than referring to them is numerical internet addresses and port numbers. 1984 The Apple Macintosh becomes the first successful mouse-driven computer with a graphic user interface. 1985 The Amiga 1000 is released, which had audio and video capabilities beyond those found in most other personal computers. 1985 Microsoft Windows follows the Graphical user interface trend first made popular by Apple. 1986 NASA space shuttle Challenger is destroyed, killing all 7 astronauts, 74 seconds after liftoff at Cape Canaveral. 1986 The first PC virus is released. 1987 The S-VHS format videotape is introduced as a high-quality enhancement of VHS. 1988 The first Internet Worm is released. 1988 The digital cellular phone is released. 1989 The World Wide Web (WWW) is invented. 1989 Nintendo releases the Super NES and the hand held “Game Boy”. Sega releases its Genesis video game console. The Australian Prime Minister was Malcolm Fraser at the beginning of this decade. He came to power in the 1975 election following the dismissal of the Whitlam Labor government, in which he played a key role. After three election victories, he was defeated by Bob Hawke in the 1983 election, and remained Prime Minister until 1991. Ronald Reagan (Republican) elected President of the USA in 1980 after defeating Jimmy Carter (Democrat). Politics enters the Olympic games with the boycott by the US of the Moscow Olympics in protest at Soviet invasion of Afghanistan. Former Beatle John Lennon is shot to death. Terrorists seize Iran embassy and hostages in London leading to the British SAS storming embassy and releasing hostages. During the 1980’s, the Soviet Union was at war in Afghanistan (1979–1989) with the Islamist Mujahideen Resistance. From 1980 to 1988, the Iran-Iraq war took place. There there was El Salvador’s civil war (1980-1992). In 1982, Argentina invaded the British held Falkland Islands, with Britain emerging victorious. Also in 1982, Israel invaded Lebanon, as a response to the assassination attempt against Israel’s ambassador to the United Kingdom. Meanwhile, the Lebanese Civil War raged on (1975–1990). The United State invaded Grenada in 1983. In 1985, the French intelligence service sank the sunk the Rainbow Warrior I whilst it was in harbour in New Zealand. In 1989, the Tiananmen Square protests took place in China and the U.S. military took action in Panama to overthrow its president. Great production from ‘way back then’. Could we possibly have something similar produced from the tvw studios showing changes over the last 10-15 years. Obviously technology has minused what we once did years ago, it would be great to see the behind the scenes aspect of the station nowdays and compare. One part I find interesting from the video, it states there were 4 studios? I always thought there were 3. Any feedback is greatly appreciated. Lets document what we have left now before the ball wrecker comes in. I am so sad, as I just heard of the passing of Peter Dean. He will be sadly missed by many. I remember him on the radio in the 60’s with his mate Johnny Friar, they were hillarious. Later on, we all looked forward to seeing him on Telethon, I think he was ‘THE ROCK’ of Telethon in those years. I send deepest sympathy to his family and friends especially those who he had at Channel 7.